Fuel Share sets a cap (or limit) on the amount of motor fuel petroleum in a jurisdiction and distributes equal tradable rights to consumers to consume the fuel under that cap. Residents receive income from selling unused portions of their Fuel Share, which resides on a debit card that can be swiped at gas stations. The goal of Fuel Share is to create a fair framework to reduce the combustion of motor fuel petroleum by increasing its costs, and providing incentives for conservation. Fuel Share can help jurisdictions reduce petroleum use, promote efficient transportation alternatives, address climate change in the transportation sector and return money back to residents. A Fuel Share system sets a cap on the amount of gasoline imported into a jurisdiction over time. Setting a mandatory, community-wide petroleum budget will ensure that its use will decrease in your jurisdiction over time. The budget can be set starting at current usage, and reducing by some percentage each year in order to phase out its use by the year 2030, 2040, or 2050. This creates an impending scarcity of fuel, which raises the price of fuel. A higher cost will reduce aggregate fuel demand, but also gives value to the Fuel Shares, which are allocated to the public, and purchased by fuel companies, recycling the revenue. In order for a jurisdiction or institution to set a mandatory fuel budget, they must be motivated to reduce fuel consumption and be prepared for potential increases in fuel prices. The initial steps are to measure the amount of fuel consumed, set a reduction schedule, and assign a point of regulation where fossil fuels enter the jurisdiction or where consumers first access the fuel. Upstream regulation (closer to the point where fossil fuels enter the economy - i.e. the well or refinery - is superior to downstream regulation (where the fuel is combusted) - i.e. the tail pipe or smokestack. Fossil fuel imports are already monitored closely, which facilitates data collection. Regulating the distribution companies greatly simplifies the reporting requirements, since there are fewer companies, making fuel easier to track. Once a fuel budget for the jurisdiction is set, allowances (shares) representing the budget are distributed to the population. Each person receives one share, and each share represent a certain number of gallons of fuel. The simplest approach is to divide total consumption by all households in the jurisdiction by the number of households. There may need to be some caveats to this, but the more deviations from the equal-across-the-board approach, the more difficult it will be since everyone will consider themselves an exception to the rule. The shares may be provided to the public through an electronic transfer into an account that is managed online or onto a debit card. The total value of all the Fuel Shares combined is assumed to be the difference in fuel prices due to the imposed budget constraint on supply. Dividing the total increase created when the fuel cap was imposed by the number of shares provides the price of a single share. Since fuel prices fluctuate for other reasons as well, the share price may be based on an average fuel price premium over a given length of time, or on the jurisdiction's willingness to pay (for example, as determined by a referendum on a fuel tax, etc.). 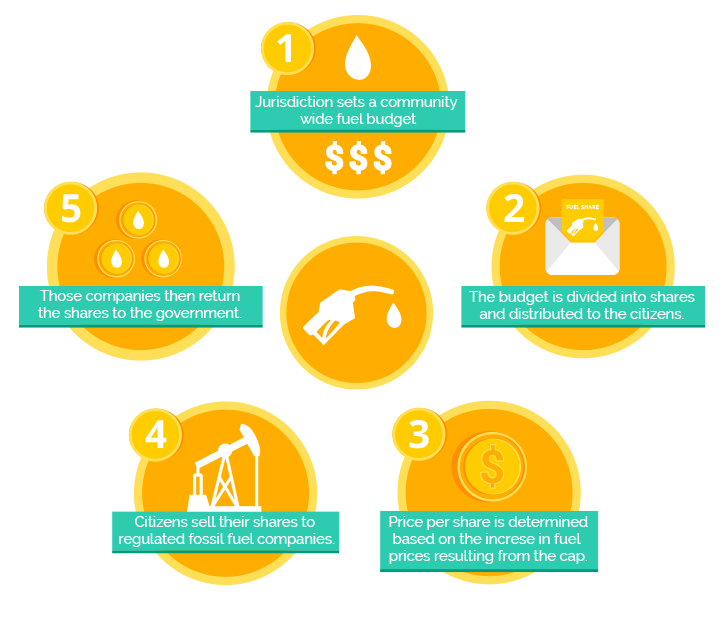 Once consumers receive the share, they sell it to the upstream fuel distribution companies. This exchange returns the increase in fuel price due to scarcity back to consumers. Consumers sell the share to the upstream fuel company electronically, or by swiping a debit card at point of sale locations. Consumers pay higher fuel prices, but receive some compensation by selling the Shares to the fuel companies. Companies must provide an accounting of Shares to the Government. The next year it starts over, with fewer gallons per share according to the jurisdiction's Fuel Budget. The sale of the share represents a rebate to the consumer. After the share is sold, then consumers will pay full price for the fuel purchased until the next allocation of shares. Whether consumers come out ahead at the end of the year, or end up paying more depends on their activities. The higher fuel price encourages conservation (driving less, carpooling, taking public transit, purchasing a vehicle with better fuel efficiency or an electric car, etc.). Like a gas tax, Fuel Share raises the price of gasoline, but it differs in some important ways. Consumers can pay gas taxes and continue using petroleum, forever. By contrast, Fuel Share is for jurisdictions that are ready to phase out gasoline and move to other transportation options. The political obstacles facing gas taxes likely apply to Fuel Share as well. However, Fuel Share returns value back to consumers on an equal basis. This addresses the regressive impacts of gas taxes, provides an incentive for conservation, and may allow for more political support. Addresses the Regressive Impacts of a Gas Tax - gas taxes are more burdensome to low-income people who spend a larger proportion of their income on petroleum. Providing an equal Fuel Share to everyone will help the low-income families more, while still incentivizing conservation across all income levels. Fuel Share supporters believe that a fuel budget can be designed to provide the right price signals to reduce fuel use, while recycling revenue to people. Governments can create a mandatory cap on fuel imports, and return the value of permits under the cap back to households. Although the Share counteracts some of the price increases in fossil fuels, it should be designed to not totally negate the price signal. The goal is to make fuel more expensive in order to change consumer behavior. However, some consumer compensation will reduce the regressive impacts on poor people. Although fuel price increases will have positive environmental effects, Fuel Share helps make the impacts on people more fair. You also want a slowly increasing price signal, and to avoid price spikes, insecurity, causing a recession, and backlash. A per capita rebate, such as Fuel Share, would alleviate some, but not all, of the impact. High carbon emitters would still pay more. Also the rebate helps preserve short-term political support for the long-term emissions cap. As part of the planning to introduce a Fuel Share program, advocates should survey opportunities for low- or non-petroleum-based transportation options such as public transit, electric cars, car sharing, availability of bike lanes, walkability, and more in their jurisdiction. Cities or the County would need to pass a law setting a mandatory fuel budget, and subsequently place a Fuel Share program on the ballot for referendum. The law would describe a timetable for the jurisdiction to develop a mandatory fuel budget. The law would also create short term funding needed to conduct feasibility studies and set up the infrastructure to issue the Fuel Shares for the first year. In subsequent years, program administration could be funded through transaction fees on the sale of Shares. The jurisdiction could also delegate program administration to a sub-contractor, while preserving full government oversight. The jurisdiction would also set up stakeholder advisory groups to provide feedback and allow for public comment. U.S. Department of Energy, Standby Gasoline Rationing Plan, 1980. California Energy Commission. “Reducing California’s Petroleum Dependence.” Joint Agency Report. August 2003. Gas Rationing to implement Clean Air Act amendments of 1970: Los Angeles. EPA Administrator William D. Ruckelshaus' proposal for L.A.: World War II-style rationing that would reduce gasoline consumption by over 80% during the smoggiest six months of the year. Borenstein, Severin. “The Implications of a Gasoline Price Floor for the California Budget and Greenhouse Gas Emissions,” Study of Energy Markets (CSEM) Working Paper Series, University of California Energy Institute, December 2008.